In the studio the 19" Sumo becomes an affordable yet incredibly powerful HDR monitor. With 10 stops dynamic range, 10-bit processing and X-Rite calibration it will accept Log, PQ or HLG signals from your grading software and display HDR in all its glory. Clients and directors can see the amazing true-to-life nature of HDR in realtime away from the camera crew with precision mapping of Log from every camera maker and playback of PQ/HLG signals. Full playback controls and XML tagging means that they can also review footage and even create an instant client lightweight ProResLT copy with baked in LUTs and audio onto affordable SSD media. You can also choose to view both Log and standard gamma images with or without LUTs applied. Toggle between different looks with ease in seconds. The combined monitor-recorder in the larger 19" size gives focus pullers instant on set access to footage with focus peaking, 2:1/1:1 zoom and the ability to tag footage as XML files. The high bright 1200nit monitor, sturdy built-in armor aluminium alloy design and variety of mounting options makes it a go-anywhere, do-it-all monitor-recorder for focus pullers. Get HDR on set in realtime with on the fly Log to HDR and PQ/HLG playback complete with mission critical scopes such as waveform, focus peaking, false color and vectorscope on the calibrated screen. Beyond monitoring, with up to 4Kp60 and 2Kp240 recording you can generate instant dailies and proxies direct to affordable and available SSD media. For the first time your on-set production monitors can be HDR capable and have recording capability. Now every monitor is not only for high quality shot preview, it can also record dailies, proxies or 4Kp60 masters and has playback controls away from the camera team on a high quality, calibrated 19" 1200nit 10-bit HDR screen. Take Sumo into the studio to use as a HDR grading monitor. Simply connect with your grading software to take Log, PQ or HLG signals from your Mac/PC and instantly see color accurate HDR in 10-bit quality with 10 stops of dynamic range. Seamlessly connect any SDI or HDMI device and convert between HDMI 2.0 and SDI (3G QuadLink/6G/12G) in any combination. Quad SDI inputs connect cameras with multiple 1.5 or 3G SDI outputs without the need for converters. HDMI 2.0 supports up to 4Kp60 input/output along with support for Genlock and LTC timecode. Capture the RAW output from Sony FS5/FS7/FS700, Canon C300MKII/ C500 or Panasonic Varicam LT over SDI up to 12-bit 4Kp30 as CDNG or 10-bit Apple ProRes / Avid DNxHR up to 4Kp60 / 2Kp240 depending on the camera's capability. The processing power of Sumo preserves pristine quality direct from the sensor with data rates of up to 3.2 Gbps. Make working with multi-cam a breeze. With a free future firmware update, you will be able to switch and mixing a live recording and stream or record 4 x HD ISO recordings using the QuadLink SDI connections. Switch between feeds on screen with cueing, cross fade and hard cuts from the locked sources or tag and adjust final edits with advanced metadata tagging preserving ISO feeds, with the desired final result infinitely editable. 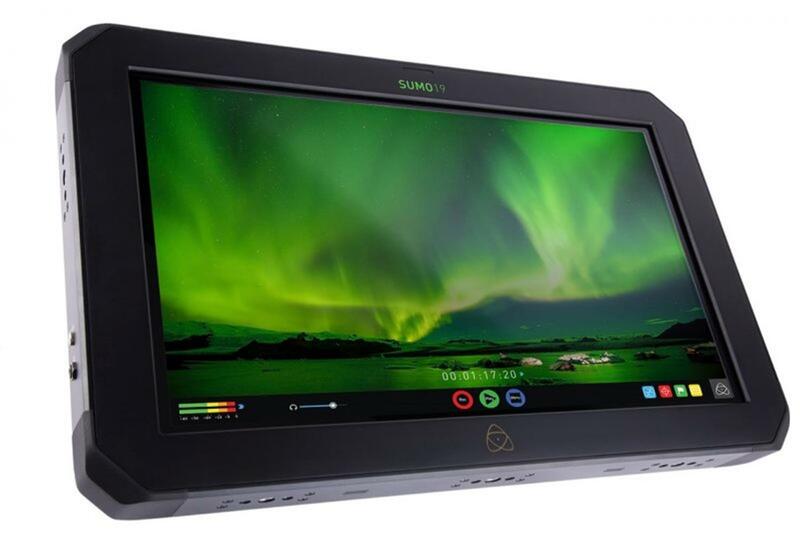 Sumo's 19" 1920x1080 10-bit LCD panel is driven by the AtomHDR engine which precisely maps the Log/PQ/HLG from popular cameras, game consoles or TV makers to perfectly resolve 10+ stops of HDR in real time. The brightness range and vivid colors of HDR bring scenes to life either on the monitor itself, or when output to larger HDR/Rec709 displays for on set review. It can also be used with popular NLE or grading suites for affordable HDR or SDR editing or grading in the studio. Like all high-end monitor's, Sumo also has optional calibration to compensate for the natural colour and brightness drift that monitors exhibit over time. Sumo's calibration input lets you use X-Rite's i1DisplayPro to always ensure accurate HDR and Rec709 monitoring. Sumo records using our patented Master Caddy system. High capacity and widely available 2.5" SSD's provide an affordable solution for long recording times. We've tested and approved over 20 drives for Sumo (atomos.com/drives) that neatly slot into the provided Master Caddy or use the custom Atomos caddy from G-Technology to integrate directly into their EV series of Raid and desktop solutions for the ultimate in workflow efficiency. Compatible batteries: V-Lock / Anton Bauer via XLR terminal (optional mounting plates available), 95Wh or larger recommended. From supported HDMI sources such as gaming consoles and graphics cards. Optional unit (XDCA-FS7) needed for Raw output.